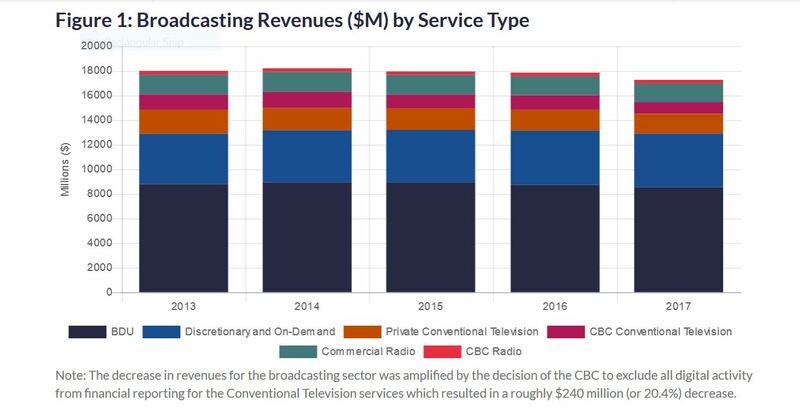 Revenues for Canada’s broadcasters fell to $17.3B, a 3.3 percent decline over 2016, according to data released by the Canadian Radio-television and Telecommunications Commission based on corporate filings for the year ended Aug. 31, 2017. Commercial radio stations posted a 1.9 percent decline in revenue to $1.52B in the 12-month period; however, many stations programming in languages other than English and French saw revenue rise more than 5 percent. The regulator notes in its findings that the overall margin for commercial radio has remained stable with a PBIT between 18.5% and 18.9% in each of the last four years. Radio markets in the Prairies account for $20 million of the $30 million year-over-year decline. Harsh economic conditions including the fragile state of the oil industry were cited as contributing factors for the lower local and national advertising revenues. Television distribution services reported a significant year-over-year decrease of $202 million (or 2.3%). The report notes that conventional television revenues are declining faster than any other industry in the broadcasting sector. Total revenues declined by 4.1% during the last broadcast year, going from $1.678M in 2016 to $1.60M in 2017. This is the sixth consecutive year that conventional television services have reported revenue declines due to continued decreases in overall advertising dollars. However, this decline is slightly lower than the average annual growth rate of -4.6% from 2013 to 2017. Despite efforts to reduce spending, overall expenses exceeded total revenues; however, conventional stations reported a slightly smaller loss in 2017 with a somewhat higher PBIT of -$101M compared to -$113M in 2016. Cord cutting saw a marginal but continued decline in subscriber numbers as IPTV added over 130,000 subscriptions to its base last year. Approximately 2.6 million Canadian households now subscribe to IPTV. Meanwhile, subscribers to satellite services fell by 7.2%. The data shared by the regulator shows that cable and DTH providers saw their operating margins fall below the 20% and 30% mark, respectively. Conversely, IPTV providers have posted their first-ever positive operating margin. This was mostly due to continued revenue growth and a reduction of 13% in overall expenses. — CRTC summary here, and detailed sectoral data here.